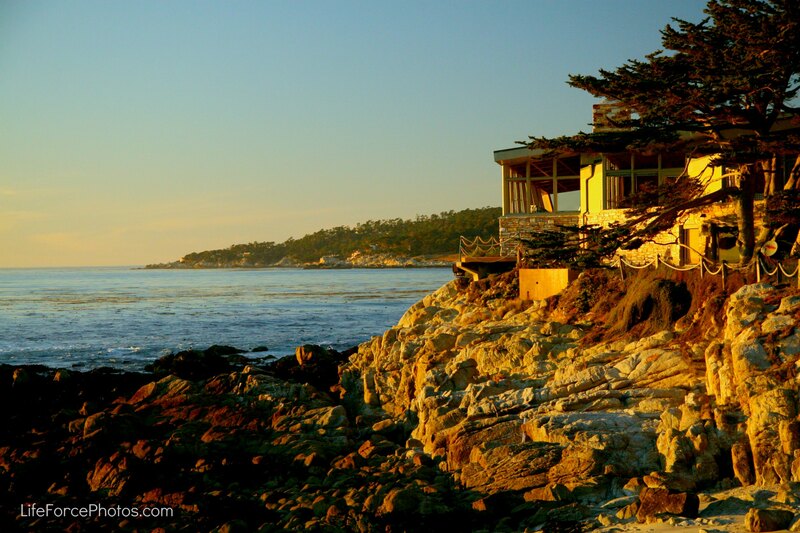 A Carmel house overlooking the beach. Hansel and Gretel cottages or homes of modern beachfront architecture line the winding shore. The flowers of an English country garden flourish amongst the cypress trees behind picket fences. Here and there are placed an assortment of driftwood carvings that give the scene a quaint seascape flair. In Carmel, people name their cottages like a boat owner would name a boat. I think they did this because there are no street addresses on the homes. You find a house by going to the intersection and then counting down from the corner or looking for the house name. 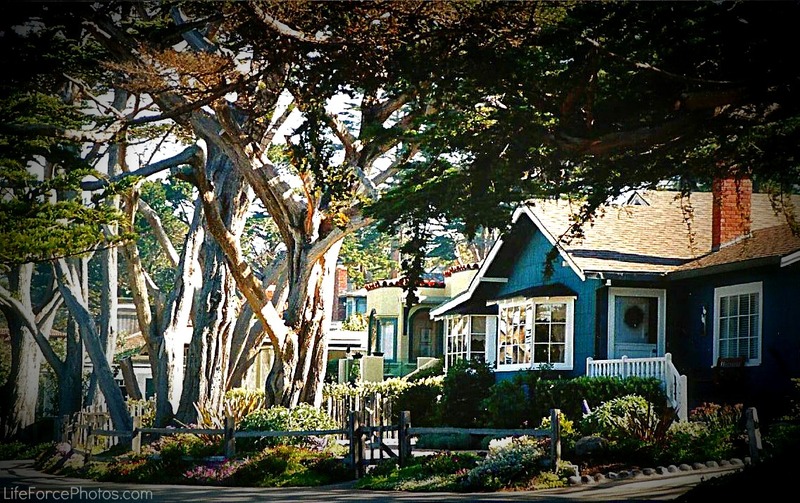 There is a map of Carmel-by-the-Sea with a complete record of the names of each of the houses in Carmel. 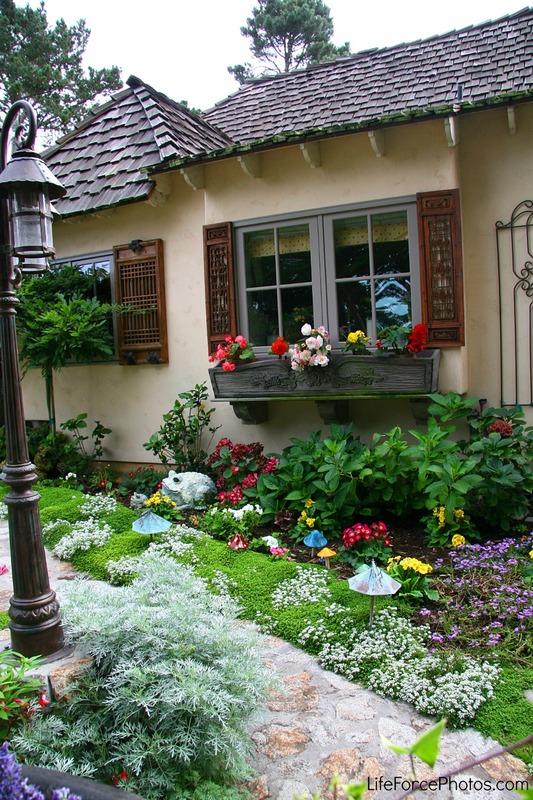 It is very unique and useful in finding the names of Carmel homes in the whole area. Map of Carmel house names. 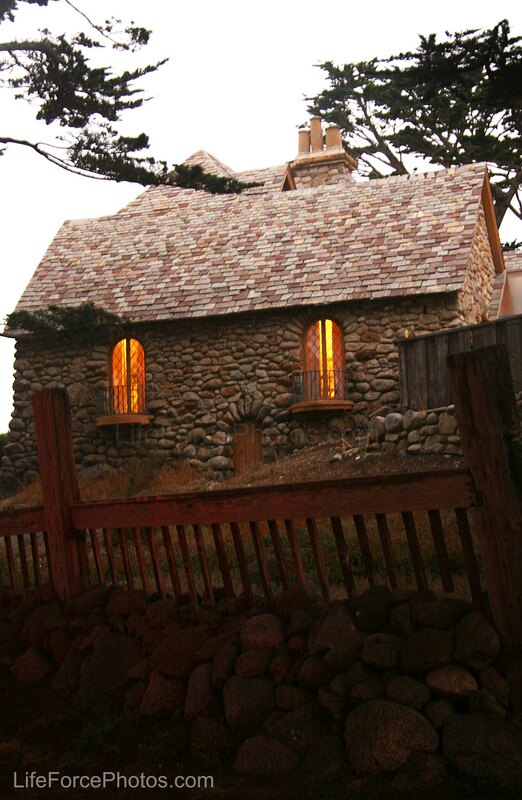 A man who started it all was Hugh Comstock with his “fairytale cottages” you see throughout the town. A favorite tea house is the Tuck Box built in 1927 and is the ultimate in fairy tale. They serve breakfast, lunch and afternoon tea in a quaint atmosphere. Walking along the streets is the very memorable restaurant, Casanova’s on Fifth & Mission Streets. It has a romantic and quaint ambiance with a French and Italian flair. The cuisine is fresh Mediterranean and daily fresh-baked bread. Charming as all get-out too! 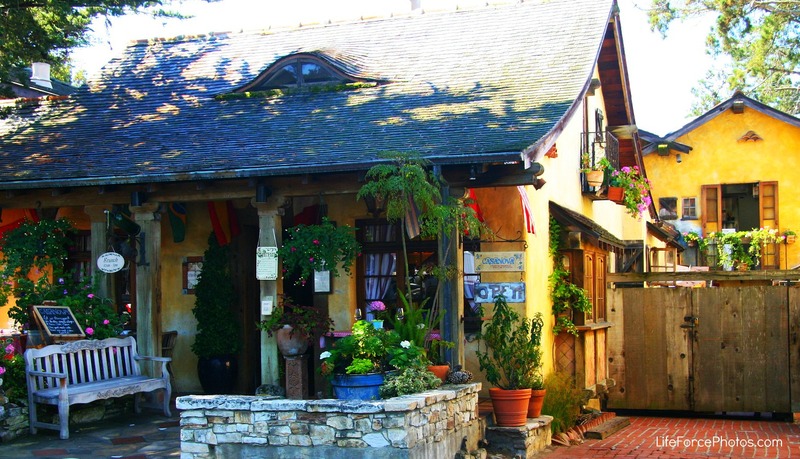 The restaurants in Carmel are as plentiful as the antique shops are amazing. They are just as colorful and picturesque as the village itself. These homes sit along the beach when you stroll along Scenic Road which travels the length of the beach area. 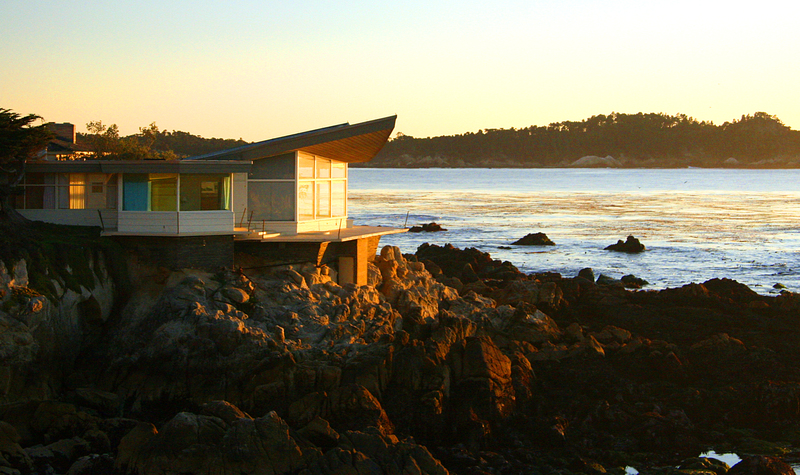 Here is a favorite shot of mine of a Frank Lloyd Wright home positioned on the rocks. I dream of living in this home as probably anyone would as it stands alone looking outward to a fabulous view of the Pacific. This is a shot of the house before the sun sets. I was photographing the sun going down and I turned to my left just in time to see the windows ablaze with the reflection of a glowing sunset! I like the way the sun’s reflection bounces off the windows. White beaches and turqoise water, skies of the deepest blue and when it is a clear day, it glistens and sparkles so. It is an ocean town with seaside sound that warms the soul. As the fog rolled in, I took the opportunity to see what interesting scenes the low-lying fog would bring. It doesn’t always have to be a clear beautiful day to find a good photo. 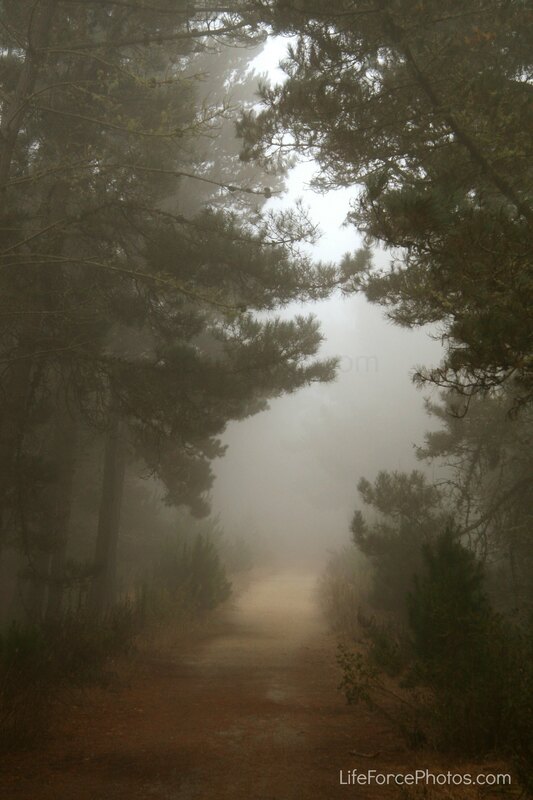 In fact fog can give quite a mysterious look to the world around us. Driving along Highway 1 toward Pacific Grove, I found a pathway in the Del Monte Forest filled with amazing Monterey Pines and Cypress tress. 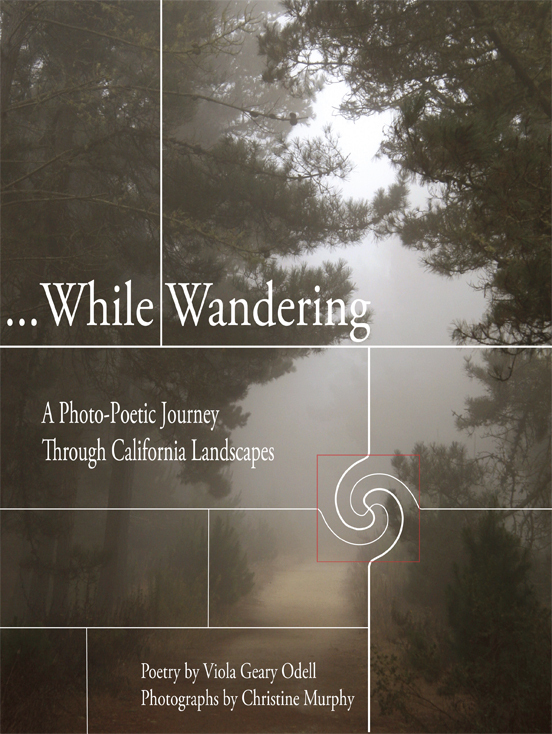 This intriguing pathway below compliments the vision for our book, While Wandering – A Photo-Poetic Journey through California Landscapes. This amazing seaside forest is cared for and protected by the Del Monte Forest Conservancy . Any contributions are lovingly contributed to this worthwhile cause. Walking further along the path I came upon these crooked and somewhat spooky trees. It was a forest that was expressively unique. 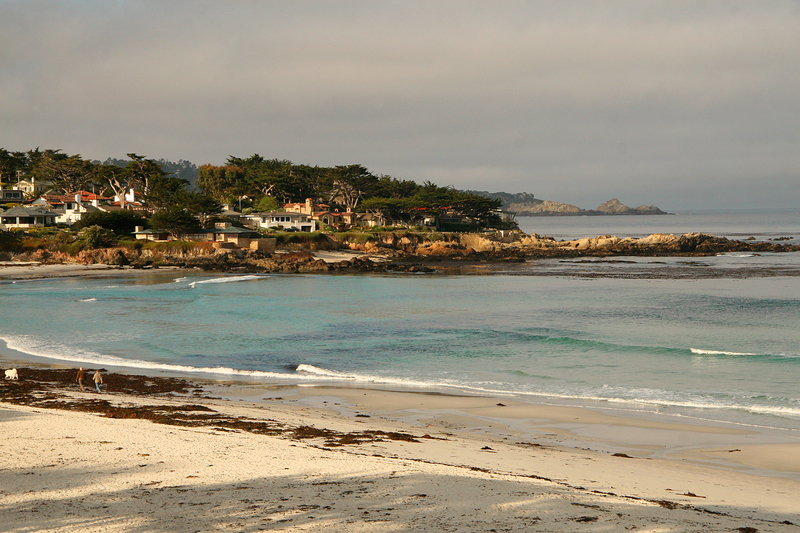 Stay tuned for more Carmel-by-the-Sea adventures and beautiful spots I have uncovered. 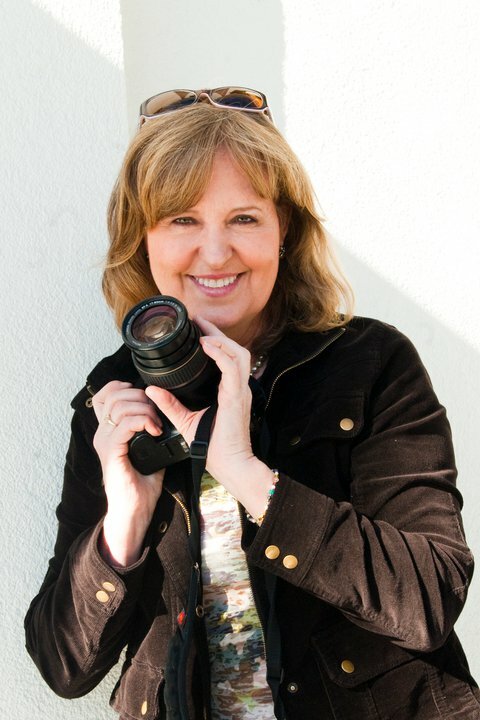 I hope you’re following us on Facebook and please check out my photo web site at www.lifeforcephotos.com. Follow my blog if you want to know more about California.